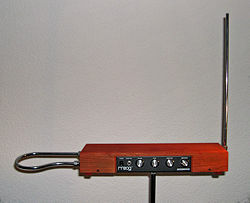 This Synthesizer was invented in 1928 by a Russian Scientist named Theremin. It was first used in Rock-n-Roll by Randy California of Spirit, and Randy introduced it to Jimmy Page of Led Zeppelin, who got a lot of mileage out of it during live performances with Led Zeppelin. 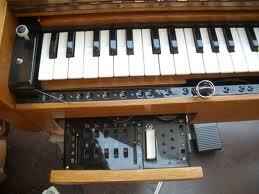 The other synthesizer is called the ondes Martenot. This synth esizer was invented in France in 1928. Radiohead owns two ondes Martenots! Here are a couple of pictures of the Martenot. They are very difficult to play and even harder to master. So on to the show. My brother Joe went with me. He is a highly trained and excellent musician. (If I may be so bold as to brag on my brother…). I have been a fan of this band for years and have always wanted to see them so needless to say I was very psyched for this show. The opening act was a band called Other Lives. This band was a real pleasure to see live. They sounded like a cross between old Peter Gabriel era Genesis, Kate Bush, and with a little Arcade Fire mixed in. Several of the musicians in the band played different instruments during their 30 minute set. At various times they had a cello, violin, trumpet, and many different kinds of percussion instruments playing. The poor bastards were jammed together in front of the giant pile of equipment for Radiohead. They could hardly move around but they really sounded great! Then to my surprise, when the lead singer introduced the band, he said they were from Stillwater, Oklahoma! I would never have guess that. They sounded English! Here is a photo gallery of Other Lives on stage at American Airlines Center, in Dallas, Texas. After a brief intermission the main event began. Here’s a taste of what it was like. The most interesting thing about the light show, however, was what was not there. There was not one single spotlight used during the entire show. In all of my life of going to rock concerts (my first show was in 1969) I have never seen a band perform without using spotlights. The message is obvious and a real insight into the mindset of Radiohead. Radiohead is a BAND! The sum is greater than the parts. This band has no Star. They are truly an ensemble performing their joint compositions. Really, that is what I love about them. They are composers not song writers. They are practicing their art on the highest level. They could care less if anyone likes it. They write their music because they have too. Because their art always comes before their popularity it was very gratifying to see a sold out hero worshiping crowd at the AAC that night. The future’s so bright I gotta wear shades!